BROSIUS TAKES 2011 TOP GM AWARD: We are pleased to award the 2011 GM of the Year honor to Claire Brosius for her outstanding work running Ticket to Ride—one of WBC's largest events—annually drawing in excess of 200 players. In winning the award, Claire breaks the glass ceiling for her gender, being the first woman to win the award. Claire came to us late in WBC's gestation, finally tagging along with husband Eric on his annual trip to WBC four years ago and was instantly hooked when she finished sixth in Lost Cities for her first laurels. Even on that first trip, she was anxious to pitch in and help in the registration room between events. Since then she has become a fixture in the auction crew and wherever else she can lend a hand. So, naturally she takes over the administration of WBC's largest event the following year and what a job she has done—hitting the ground running as a supremely organized human dynamo who broke into our Top Six ratings in only her second year on the job and won the whole shebang in her junior year. For winning the GM of the Year, Claire will be our guest at WBC 2012, and provided he behaves, she can bring Eric along too. More details including the results of our Top Six GM voting are available at http://www.boardgamers.org/wbc/topgm.htm. EUROQUEST 2011 UPDATE: Our next convention is at the Pikesville Hilton in Pikesville, MD, on Nov. 3-6, featuring twelve Euro competitions and a wide variety of demos and plenty of Open Gaming. Pre-registration and hotel deadlines (Oct. 20) are just hours away for this year's EuroQuest. Please be advised that the room block reserved for EuroQuest attendees is almost sold out, but a few rooms have been added with the proviso that anyone booking must book at least a two- night stay. If and when the room block is sold out, information about alternate hotel locations will be posted. Pre-registration (including instructions for on-line pre-registration) may be found here: http://www.boardgamers.org/specific/registereq.htm. Details, including a schedule and event previews for all tournaments may be found at http://euroquest.gamesclubofmd.org. Information about all the non-tournament activities has been collected at a new webpage called "EuroQuest Presents" at http://euroquest.gamesclubofmd.org/EQ_Presents.aspx. WAM X: Details are complete for the tenth Winter Activation Meeting for players of Card Driven Wargames to be held at the Timonium Holiday Inn, in Timonium, MD, from Jan. 26-29, 2012. The four tournaments will once again be Twilight Struggle, Washington's War, Hannibal and Combat Commander plus the usual open gaming opportunities. BPA has secured a group room rate of $99 per night plus applicable taxes for those making their reservations before Jan. 7, 2012, or when our roomblock sells out, whichever occurs first. Full schedule and pricing information is available at http://www.boardgamers.org/specific/wam12ann.htm. PAUL BOLDUC: We regret to report the passing of longtime member Paul Bolduc who died of cancer on Aug. 31. An original Avaloncon Game Master for Wizard's Quest, Dr. Bolduc did not let the demise of that event deter him from attending every year through 2010. A more detailed report can be found on our Memorial page at http://www.boardgamers.org/memorial.htm. WBC EVENT REPORTS IN PROGRESS: Event After Action Reports are being collected now and used to update over 150 Event pages on our website for a scheduled November unveiling. The 2011 GMs who have yet to fulfill that part of their obligation have been notified that the clock is ticking and that prize level and eligibility penalties will apply for those events whose GMs do not comply. WBC is unique among all gaming conventions for providing not only this coverage but also archiving such reports for posterity. 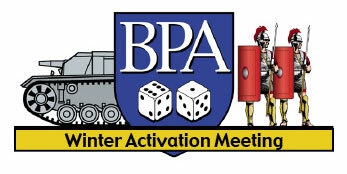 Check out the BPA Archives section of our home page http://www.boardgamers.org/index.htm#archives to check out the progress of your favorite event over the past 12 years. WBC 2012 EVENT SUBMISSIONS: November will soon be upon us—and with it your last chance to muster support for a new WBC event by getting it on the membership ballot or moved into the Pre-Con. There is a limited amount of space available for early starts so if you contemplate moving your event to Monday or sooner, you need to start the process now by getting approval early enough for us to acquire the required space. Such moves to or from Pre-Con or Monday status should be discussed asap with conventiondirector@boardgamers.org. Those merely wishing to get an event on the membership ballot who are willing to GM that event should complete the required event form at http://www.boardgamers.org/forms/SubmitEvent.php after reading the GM Guidelines linked from the start of that event form. Nothing happens at WBC without a willing GM behind it. SOCIAL NETWORKING: Keep up with WBC electronically by joining the World Boardgaming Championships (WBC) Facebook group and the BPA_WBC Twitter Page. You can also easily find us in the Boardgame Geek Forums	under Gaming Related, Conventions, WBC. MARCH MADNESS IN NOVEMBER: The 9th Annual PBeM tournament begins November 1 with the team draft. On the heels of the largest field ever for this event at WBC this summer, this could prove to be the largest PBeM tournament to date. All games will be played using the ACTS module at http://acts.warhorsesim.com/index.asp. Each player will have two teams in separate single elimination brackets. For details see http://www.nktelco.net/bdmonnin/mms_home_page.html. Email GM Bruce Monnin at bdmonnin@nktelco.net to join. NAPOLEONIC WARS IN DECEMBER: A new tournament of GMTs Napoleonic Wars will start on Dec. 30, 2011, with signups to be completed by Dec. 20. Entrants will play three preliminary rounds of the three- player game taking each position once. The top six players will then play the two-player game. The aim is to complete the Tournament within the calendar year, with a maximum of 48 hours between card plays, no game to take longer than a month per turn. It is likely that some players will have two games in progress at once. Default setup is ACTS & Cyberboard. See https://sites.google.com/site/wilphe/home/tnw-2-5-2012 for details and enter with Wilphe@gmail.com before Dec. 20.